The Auto locksmiths 8 day beginner's course is a way of attending an all-encompassing course in a flexible way. The course is designed so the candidate can attend the foundation 5 day course and then complete the 3 days of specialist training as and when dates suit best. This course is suitable for those with little or no experience in the auto locksmith trade and offers in depth training in both the mechanical and electronic parts of the market. This course is designed to teach candidates with little or no previous experience how to strip, service and reassemble all types of locks fitted to modern motor vehicles. Our students will understand the workings of the lock and therefore how to open them when no keys are available. They will be taught how to cut and decode keys, learn how to use diagnostics & transponder programming and cloning machines, as well as how to carry out eeprom programming. The course is 90% practical to ensure you know how to put the theory into practice. Upon completion of the course you will have the ability to start practicing as a knowledgeable Auto locksmith and have an in-depth ability to work on the vehicles trained on. You will also receive a detailed instruction manual and training certificate. Locking systems fitted to Ford, Vauxhall, Rover, Peugeot, Renault and VAG vehicles will be covered in great detail and other systems within the given time frame. 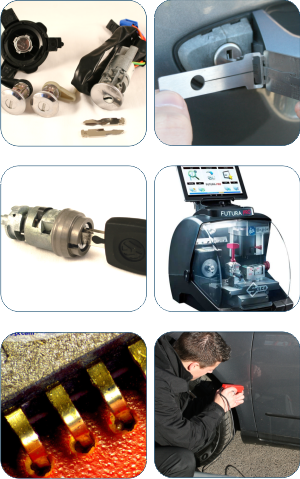 Within the training course you will have the chance to see and use the very latest state of the art equipment available to the modern Auto Locksmith, including key programming, cloning and eeproming equipment, as well as the Mr Li range of lock picks. The course is ideal for locksmiths not involved in the auto market, motor trade operations that want to offer auto locksmith services and people looking for a career change into a niche market with a high level of technical content and good rewards. The 8 day course offers the same sylibus as the 5 day course but also includes three of the single day training courses; namely, Key & Remote Programming, Understanding Transponders and Eepromming Procedures. This course can be taken as 8 continuous days or alternatively the 3 additional days can be held over for a later date. It is ideal for candidates that are currently employed and therefore need flexibility on the training dates.